It is able to carry out hourly forecasts of single farms, little groups of farms or wider areas. Wind energy is one of the main sources of electricity generation in our country, and Spain ranked fourth on the world only behind China, United States and Germany in terms of installed capacity. At the moment, the installed capacity in Spain is 23,000 MW, covering around 20% of the electric demand. Forecasting the generation of this unmanageable resource is necessary to integrate it to the electric system. EA2 is a system to forecast wind power production designed with 100% IIC technology based on applying predictive analytics techniques, neural networks and Support Vector Machines (SVM), among others. Predictions are generated using weather forecast and electricity production data, and can be applied both in a single wind farm and in groups of farms in wider areas, such as a group or cluster, or the whole Iberian Peninsula. The system is a SaaS product, and generates forecasts depending on the frequency of refreshment required, adjusting to the needs of both national and international electric markets. EA2 applies predictive analytics techniques to offer agents accurate forecasts that may be used for the offers of generation of the electric market and to plan regular maintenance. It is also an effective application for Transmission System Operators (TSO) such as REE, since it helps them improve the generation programmes and manage the stability of the system. After receiving new data from weather forecasts and electricity production, EA2 generates new forecasts, so the system collects all this new information very quickly and reinterprets the conditions of the environment, generating highly reliable new information: the forecast. EA2 updates forecasts at least twice a day, and the maximum number of updates is determined by the frequency of refreshment of the entry data. It obtains excellent results: absolute error and relative error of forecasts are very low, which results in profits for the service users. It adapts to clients’ demands successfully. It is a fully automatic system, a SaaS product, ready for self-learning at any time. EA2 algorithms approximations, carried out by the IIC team of experts in machine learning, can be adjusted, improved and renewed according to the needs from wind farms and considering commands, periods of unavailability, etc. Every hour 100% of the installed capacity in Spain is analysed by EA2 and hourly forecasts are updated for the next ten days. One example of R&D+I actions related to EA2 is the estimation of the products of meteorological agents, so the best approximation forecasts are always offered. Selling wind farm energy at the electric market requires hourly production forecasts a day in advance. For instance, the daily electricity market closes at 10 a.m. every day and there prices are negotiated for the 24 hours of the following day. Wind farms, as any market participant, must pay a penalty for deviations generated, i.e., for the difference between the offer made to the market and the amount actually produced whenever the system is not benefited. An accurate forecast is, therefore, a distinctive value, involving a direct economic reward as deviation charges would be reduced. However, forecasts are not only important from a market perspective, but also for the work involved in the operation and maintenance of farms. Both aspects have a direct impact on the farm economy, so acquiring a reliable and accurate model means counting on an extremely useful and particularly redeemable tool. 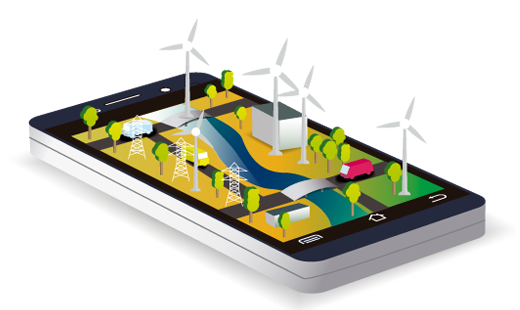 EA2 is a system specially developed for agents related to Smart Grids. They may be Transmission System Operators (TSO), Distribution System Operators (DSO), energy generators, energy suppliers, companies related to energy efficiency and, in general, companies requiring modelling and prediction techniques to improve processes. EA2 model makes it easier to be applied virtually at any area of the world; we work both inside and outside Spain. 100% of the installed capacity in Spain is analysed every hour by this service, and one of our clients is REE (Red Eléctrica de España), the Spanish Transmission System Operator (TSO). Selling wind farm energy at the electric market requires hourly production forecasts a day in advance.